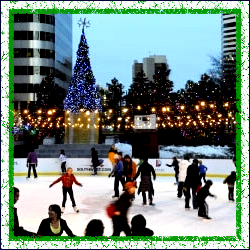 The Orchard Town Center Skating Rink is a great place to visit during the holidays in the Westminster Colorado Wintertime. If you want to have some fun and dress up in a silly or tacky sweater, you can get buy one get one tickets to the ice-rink on Thursdays . . . come out to The Orchard Town Center in Westminster this season for a great outdoor ice-skating time!